The Case of The Porterhouse Queen | What I think About When I Think About Writing. The following is a story I wrote on WEbook.com a couple of years ago. It’s a Sherlock Holmes pastiche, fan-fiction if you would. It’s not very accurate in a historic sense, so take its claims with a pinch of salt. Just read and (hopefully) enjoy. Thank you. “I think we’ve been rumbled, Holmes,” I said, casting a quick glance at my companion. We’d been sitting in the Stag’s Head near the south bank of the Liffey, the river that runs through Dublin, the principal city of the Irish Free State, for nearly seven hours. Holmes was nursing a brandy and port. I was drinking a Gold Label. “Never fear, Watson. I daresay our stipend will cover another round. Would you do the honors?” Holmes did not look at me while he talked. Instead he was carefully examining a large oil painting that hung on the wall behind the serving counter. It was, I estimated, seven feet in length across and four feet down. It had been hung dead centre and was the only decoration the proprietor had deemed suitable for his premises. The rest of the public house was bereft of any such embellishment, save for the obvious and necessary gas-lighting. I went up to the counter. The proprietor was busy polishing a tray of stemmed champagne flutes. He was making quite a fuss of it too. I caught his eye and ordered for myself and Holmes. Indeed he did stock the bottle my friend had suggested and poured two generous measures. I paid the man and was on my way back to our table when he called me back. I was stunned speechless, but managed to squeeze out a muted thanks. I was perplexed to say the least. Holmes had once again neglected to tell me the full nature of our visit to Dublin. I was disappointed with my close friend’s behavour. I really didn’t think he was the same man when he came back from near death at the Reichenback Falls. Moriarty had perished that fateful day while trying to murder Holmes, and a part of me believed that Holmes was actually missing his insane nemesis. At this point a group of travelers came through the door. There were ten of them. They congregated at the serving counter. The landlord busied himself serving them porter from a barrel he kept out of sight. It was jet black with a thin head of creamy foam. All ten had the same in large tankards. I turned my attention back to Holmes. “Come on Holmes. Out with it.” I was starting to lose patience with my companion. “Do you see our fellow travelers?” he said, meaning the group that had just come in. They were enjoying a lively discussion and I noticed that one particular gentleman was paying close attention to Holmes and myself. He was quite tall, over six foot, thin but athletic. He wore a small pair of round spectacles, resting at the top of a nose that could only be described as Roman. Caesar would have been proud of it. I counted them from where I was sitting. “A dozen,” I said. Holmes raised his hand to de Valera. The President lifted his glass of porter in salute to Holmes and myself. He turned around to his own companions, spoke with them for a bit and then beckoned us over to join him. “What agreement, Holmes?” I was completely at a loss to explain to myself what was going on. “All in good time, Watson. Landlord, if you could help me with the painting please.” Holmes and the landlord stood on either side of the painting and removed it carefully from its position. They laid it face down on the cobbled floor. Holmes took a swiss army knife from his coat pocket and, in small deliberate motions, removed the painting from its frame. When that job was completed, de Valera crouched down beside Holmes. “Take away the backing board. You’ll find what you require beneath it.” This Holmes did. Underneath were four sheets of paper, slightly yellowing in colour. There was writing on them, as well as diagrams and maps. 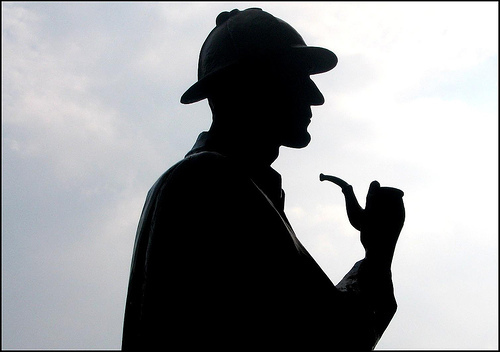 Holmes put on a pair of black leather gloves that he had retrieved from another of his pockets. He gently lifted up one of the sheets. Holmes had many pockets in his coat. From another one he produced an envelope. With surprise I noted the Royal Seal. King George had written whatever was inside. I had remained silent throughout, but now I couldn’t contain myself. It was de Valera who answered. “My spies found plans that Hitler plans to invade Europe and launch an attack from France onto mainland Britain. My government and yours, without the knowledge of Prime Minister Chamberlain, came to an agreement. We would hand over the plans and, in return, would be allowed to remain neutral should war break out. “We are a new state, recovering from our own civil war. We can barely afford to be involved in another, more far-reaching one. Your king agreed, in principle, providing the plans were genuine. I believe they are. This letter, which Mr. Holmes holds in his hand, is as important to this country as the Proclamation of Independence was twenty one years ago. We were handed our glasses. We raised them in salute to God, King, Ireland, Great Britain and, above all, peace in our time. This entry was posted in Original Writing, writing and tagged Baker Street Irregulars, Doctor Watson, Fiction, History, Irish Free State, Jude Law, RMS Titanic, Robert Downey, Sherlock Holmes, Watson, writing. Bookmark the permalink. Most definitely a twist on what really happened, huh? I’ve always loved Sherlock Holmes and Dr. Watson and you could easily fill the doctor’s shoes whilst still looking as handsome as an Irish rogue ever could! Damn, I love your historical fiction. Throw in Holmes and Doc Watson and I’m all over giddy. Great job, sir. Thanks Ryan. I’d forgotten I wrote this. A conversation with my boss and a customer jogged my memory, though. Very well done, James. I’ve somehow managed to miss this on WEbook. I had no trouble at all feeling that I was reading a genuine Holmes. One thing, and this may be my ingnorance, but is the extra apostrophe correct in your phrase “His Majest’y’s Government”? Let me tidy this up when I get home later. Thank you for your kind comments, my friend. Well, sir. Finely crafted. Alas! I am not a fan of Mr Holmes (Should I withdraw from the premises post haste?) though I have read enough to know ya done good! Withdraw ye not! And thank you.